Go For Broke National Education Center (GFBNEC) has announced the winners of its 2014 High School and College Student Essay Contest. Thirteen students will share $6,000 in prize money, and the top 30 winners received complimentary tickets to attend GFBNEC’s Evening of Aloha Gala Dinner on Sept. 27 at the Westin Bonaventure Hotel & Suites in downtown Los Angeles. 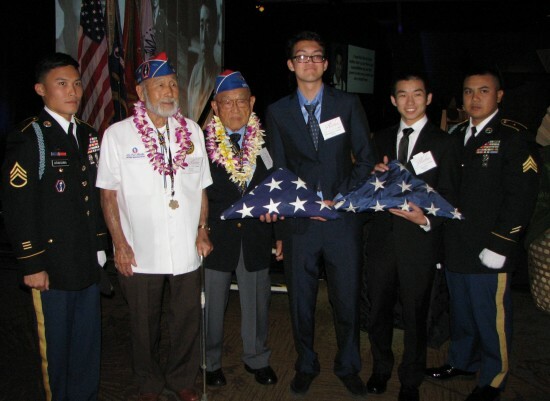 College grand prize winner Spencer Tanaka shares how grandfather “Hoppy” Kawashima’s generosity changed people’s lives; high school grand prize winner Christopher Lindsay writes about how Nisei soldiers created a more tolerant and just world for today’s generation. A total of 223 students from 53 high schools and 22 colleges and universities in 13 states participated. Go For Broke is grateful to Pacific Global Investment Management Company and an anonymous donor for sponsoring the cash prize awards. Pacific Global’s donation is made in memory of long-time community philanthropists and business leaders Manabi Hirasaki and Sig Kagawa. Serving as judges were four retired teachers: Nancy Sagawa, Norwalk-La Mirada School District and ABC Unified School District; Mae Puni, Redondo Beach Unified School District; Amy Tsubokawa, Norwalk-La Mirada School District; and Naomi Jue, who taught at numerous schools in Northern and Southern California. The 30 winning essays were presented in a booklet given to each attendee at the gala, and have been posted on the organization’s website, www.goforbroke.org. Seventh Prize — Mahya Bigdeli, Poolesville High School, Germantown, Md. Noah Rohm, homeschool student, Riverview, Fla.